Now, I’m under no elusion that we all lead busy lives and that we couldn’t possibly actively listen to everything (especially if you have kids!) BUT that certainly doesn’t mean we shouldn’t try more. You’ve all heard the phrase “there’s not enough hours in the day” right? We now try to pack so much into our 24-hour day that now we even try to rush through our conversations. Ever caught yourself finishing peoples sentences? You might not even know the ending, might even get it wrong. Ever found yourself hurrying someone’s story along? “Yes…yes…okay…yes…”. It’s something I’ve (shamefully) noticed in myself and will definitely be trying to change. You will have probably noticed it in yourself from time to time too, or at least others around you (We tend to notice traits in others first). How can we possibly be TRULY listening? You might even find yourself thinking about what you’ll be doing when the conversation is over. Have you ever stopped to consider how the quality of your professional service is affected by your ability to listen? Once I realised these habits, I did. I think it’s easy to undervalue the impact of being a good listener, and that’s not just at work. It’s much easier to build a relationship, professional or personal when both parties truly feel like they’re being heard. More streamlined – No constant backwards and forwards clarificationcalls and emails. In my personal life; simply, everyone who plays a part feels more valued. 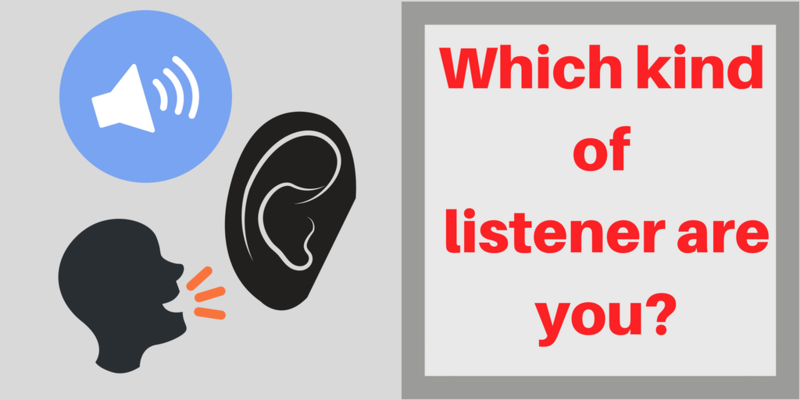 So I ask you, which kind of listener are you?